- One of Star Trek's worst episodes and complete filler. - In the first scene, Spock mentions that the ship is entering a new "solar system" rather than a new planetary system. This is a common error. The term they were looking for is planetary system. The planetary system we live in is called the Solar System because our star is named Sol. As such, the term "Solar System" is a proper noun, not a generic term. - A planet forming exactly like Earth in every detail, as shown in this episode, is completely impossible. I might have accepted this if they attempted some kind of explanation, but they don't even try. 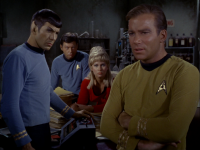 - Why does Kirk order Spock to make a helm adjustment at the end of this episode? Did he have something against the helmsman or something? - This episode establishes that Star Trek is set during the 23rd century (the 2200s) as there is dialog which states that 1960 was around 300 years ago. 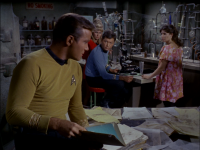 - This episode establishes that Rand has a crush on Kirk. - William Shatner's daughter is one of the children in this episode. - This episode is a candidate for my "Worst Episode of TOS Award." - Spock: "It could be a beaker full of death." An episode about children who age very slowly and then die at puberty doesn't sound like that bad of a story until you factor in the fact that the entire thing takes place on another planet which is inexplicably exactly like Earth where apparently a second evolution of humanity lives. Add to that, none of the characters seem terribly interested in investigating why another planet exactly like Earth complete with a second evolution of humanity could exist. Instead, the entire episode focuses on the plight of the children whose acting performances are insufferably embarrassing to watch. Even setting aside all of that, the plot is meager and fails to adequately explain how the children could have possibly been able to gather food for 300 years without trouble or why their food source is finally beginning to run out conveniently just as the Enterprise arrives. Likewise, I've got to wonder just how so many of the children, and especially Miri, were able to keep their clothes so pristine after all this time. But it's a necessary plot contrivance, I suppose. After all, how could Kirk seduce a prepubescent girl if she didn't have pretty clothes? Do yourself a favor and skip this one. English Imperial Units: Who is to say that Starfleet personnel are not allowed to use them? Ok, they use the metric system most of the time, but still I think it is an insignificant detail, since we still get the picture. I think miles and feet had to be expected in Star Trek anyway, given that the English system is still very much in effect in the US, where this series happens to have been created. It doesn’t bother me, to be honest, even though I wish that they would finally come around to the metric system. I'd have to agree, this episode is really dumb. A duplicate Earth, not explained at all. A strange disease that wiped out the entire adult population of the planet. Kids several hundred years old that have never even mentally matured ... what?? Just if a child's physical maturing is halted, that doesn't stop them from maturing mentally and emotionally. This episode acts as if maturity is purely a physical thing, and not a simple matter of having been alive long enough. It's probably both, but that detail is lost. The kids are just irritating. I liked Miri, though. Moreover, there are loads of plot holes. Wouldn't they investigate the planet a bit before just beaming down? Attempt to talk to someone? Scan for life forms? Send a probe? As you said, what did the children eat? They're obviously incapable of even comprehending rational ideas, let alone farming or whatever. Plus, when the crew leaves, they just talk about leaving a medical crew behind to care for the children. A whole planet of children?! At least several hundred million children, all infected with a disease that will kill them when they (eventually) grow old? Asinine. It seems as though the producers and writers of this show were really still finding their feet; a lot of the episodes up until now have either been equally or nearly as pointless or have at least had completely random, weird stuff thrown in. Like the "barrier" at the edge of the galaxy in Where No Man Has Gone Before. Or the going back in time at the end of The Naked Time. Oh well. I grew up with TNG, so I can't help but judge this show by TNG's standards. In response to metric vs. imperial: Anyone who has studied astronomy, physics, and everything else one would study in Starfleet would be entirely accustomed to using metric units. When I took even a beginning astronomy class, I don't think the word "mile" was uttered once during the class. Starfleet is not specific to one country, so they wouldn't use a measuring system that is only used predominately in one country. Especially Spock, who's an alien. Why would he learn an antiquated (and illogical!) measuring system that's not used by the majority of Earth's population even now, let alone in 300 years? The only real reason I can see for the writers using imperial units here is that Americans were extremely resistant to the metric system, and still are to a degree. Fortunately, TPTB wised up by TNG's day, and only used metric from then on (though if you'll notice, they always say Celsius after a temperature, even though that should be obvious). "We're not given any reason for why this planet is exactly like Earth." You DO know that Star Trek is fictional, right? I've heard that any real extraterrestrial looking as similar to humans as Spock does (pointy ears notwithstanding) is less likely then a pen thrown into the air doing a perfect curve in the air and then falling perfectly straight and landing on its point. If you're willing to suspend your disbelief in Vulcans looking pretty much like humans except for pointy ears, then why not do the same with alternate Earths? @411314, that argument is completely ridiculous. The odds of a planet forming that is exactly like Earth in every detail are far, far more unlikely than an alien race evolving a similar physiology to humans. In fact, one of the foundational science fiction concepts in Star Trek is that (aside from the obvious TV budgetary motive) evolution frequently leads to human-like aliens because it is the most practical morphology to have on an M class world. Planets of similar size and atmospheric composition would inevitably produce organisms best adapted to them. However, the key concept here is similar but not identical. This planet in this episode was *identical* in every way. I can live with similar planets; even extremely similar planets if the ridiculous odds are acknowledged on screen. But barring some sort of parallel universe explanation, identical in every way is too absurd. "The odds of a planet forming that is exactly like Earth in every detail are far, far more unlikely than an alien race evolving a similar physiology to humans." Still, an alien race with an appearance similar to humans is unlikely and nobody on this forum seems to have called than an "absurdity" or expected and explanation for it. "In fact, one of the foundational science fiction concepts in Star Trek is that (aside from the obvious TV budgetary motive) evolution frequently leads to human-like aliens because it is the most practical morphology to have on an M class world." "...barring some sort of parallel universe explanation, identical in every way is too absurd." If you can live with identical universes, why not identical Earths? The fact is, this entire show is not particularly scientific, and complaining about this or expecting it to be scientific is quite silly. It's rather like watching a looney toons cartoon and saying "we are given no explanation as to why Wil E. Cyote, when he runs off a cliff, stays in the middle of the air for a few seconds before he finally falls". This is definitely one of the better episodes. "Still, an alien race with an appearance similar to humans is unlikely"
Far less so, and there explanations for it. In addition to the one I provided in my above post, see TNG: The Chase. Star Trek's shorthand for a planet suitable for human(oid) life. "If you can live with identical universes, why not identical Earths? The fact is, this entire show is not particularly scientific, and complaining about this or expecting it to be scientific is quite silly. It's rather like watching a looney toons cartoon and saying we are given no explanation as to why Wil E. Cyote, when he runs off a cliff, stays in the middle of the air for a few seconds before he finally falls." Star Trek is actually pretty good about sciencey things, except in horrible episodes like this one. Parallel universes are a real concept which is explored in quantum physics. If a parallel Earth from a parallel universe could somehow be transported from one universe to another, it could explain what occurred in this episode. That explanation is fairly ludicrous, but it's better than what we get in the episode and it might have saved its score from a zero in my book. But still, many of these parallel universes would decidedly *not* be the same. There are an infinite number of universes, and it would be an extreme coincidence if something that looks exactly like Earth would pop out from one of those universes into our own universe. I like what you say about evolution on M-class planets. But I don't completely buy it. There are many many species on our own planet, and any of them could evolve into having a cerebral cortex and using tools. And some already have, like many primates. They really don't have to look all that much like us. They just need a few limbs to manipulate the world around them. They don't have to stand upright, or even develop verbal communication. For budget-reasons obviously, on Star Trek even the weirdest aliens usually look like humans with deformed faces. Now I'm wondering what would happen if you'd surgically give a contemporary orangutan the ability to speak (they need an extra bone in their throat for complex sounds). It's entirely plausible that we would consider him an intelligent being, able to cope with math, languages, philosophy... the works. If such an experiment succeeds, we may need to reconsider our view of intelligent life. I really don't understand the criticisms of this episode. Sure, the premise of a duplicate Earth is silly, but that's tangential to the main plot, which is the virus and the fate of the children. 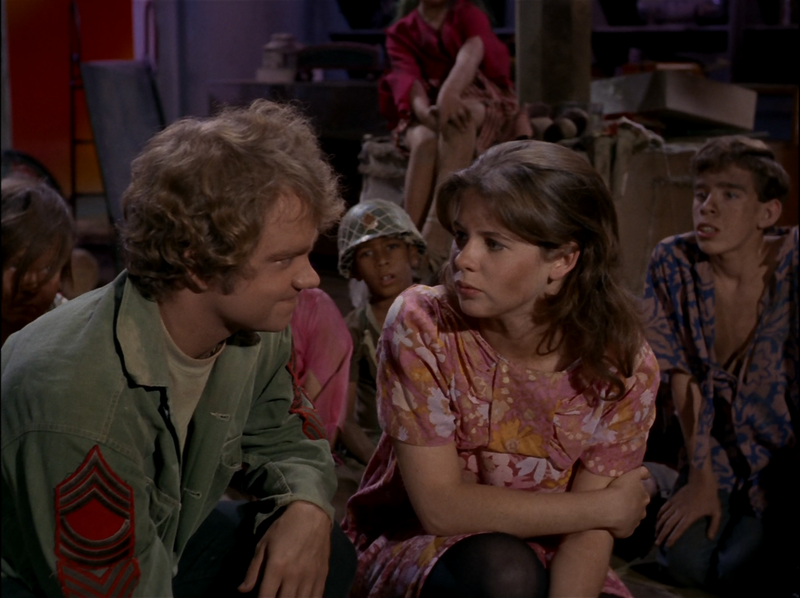 Most of the children play their roles well, and the delicate subject of a pre-adolescent crush on Kirk is well-handled. The duplicate Earth was a red-herring, but there's no reason to give this a 0 because of that. It rates a solid 8 for me. Yes, the identical Earth bit is just bizarre, and I would certainly complain about it vociferously if you hadn't already done so. Why do they make a big point about it, then drop it completely? But by the same point, I don't see this as contaminating the rest of the episode. You can just ignore it as a temporary script malfunction. The rest of the episode works fine if you just blot this from your mind and pretend that this is just a regular M-class planet. I also found it hard to believe that the children survived in an infantilized state for 300 years, I would find 30 years more plausible. Although these are certainly negatives, I thought this episode was not bad, it had some definite positives. While not all of the acting is great, a lot of the scenes invoke legitimate parts of the human experience. 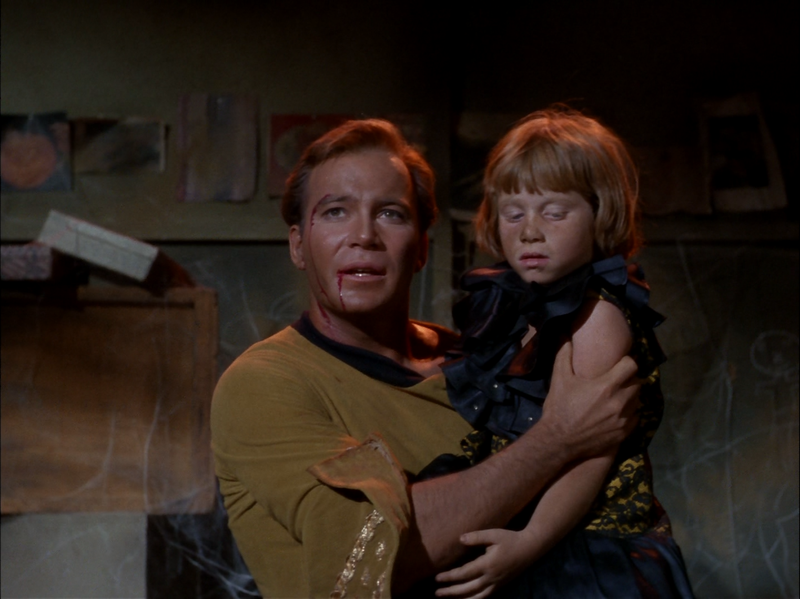 The idea that the children were led by a demagogue who was threatened by Kirk's appearance. 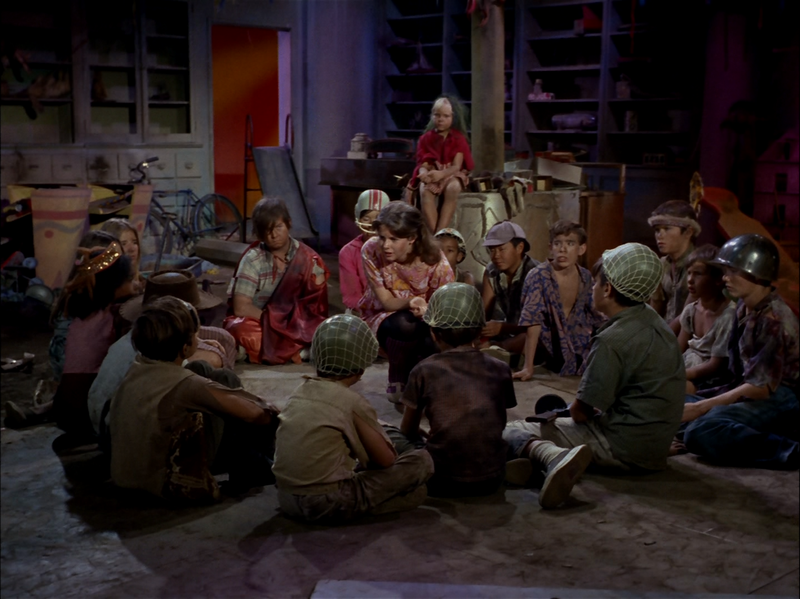 They way the children shout down Kirk and refuse to listen to him, banding together against the scary outside influence. The way the children, despite their immaturity, are a real menace to Kirk due to their knowledge of the terrain. The difficulty Kirk has trying to deal with children who are immature but know they have power. They way it is hard for them to trust Kirk because they know he will soon become an irrational monster and betray them like all the other adults did. They act unreasonably, but life is full of unreasonable adults, and these are only children. 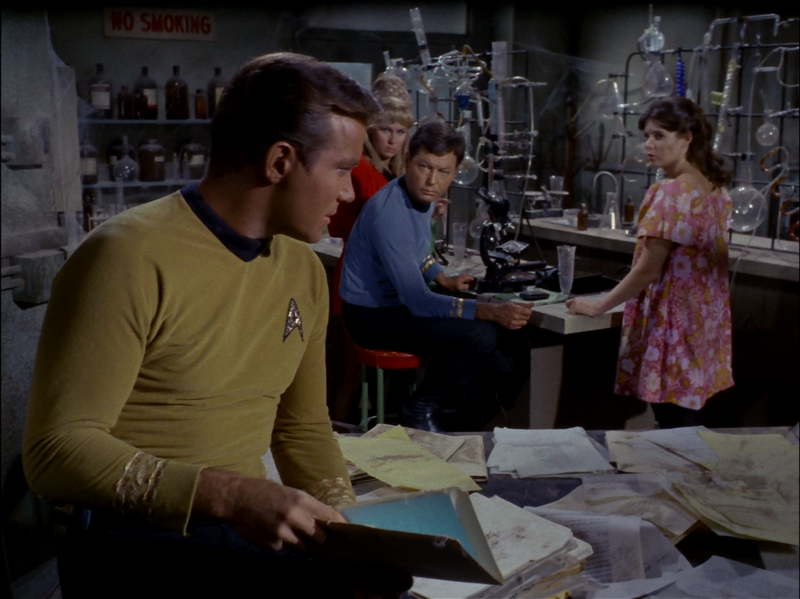 And I like Miri's crush on Kirk, and the way he handles it. The search for the cure was overdramatized in typical TOS style, yet entertained me more than many of the perfunctory TNG equivalents. Also, aside from the technical negatives, there is one technical positive. This was one episode where they were sensible about quarantine, refusing to contaminate the ship, yet having the ship beam them down necessary supplies. Just started watching Star Trek and Im hooked. Your site has been a great help. I will say after watching this episode, although kind of annoying with the children who didn't develop mentally because their physical predicament. This comment is to point out the bashing of a"earth" that developed just like our own in every way. Being a physics student this idea isn't so far fetched as one of the theories explains the idea of infinite possibilities, dimensions and so forth. If you are interested in reading more about how this is possible check out this link. That theory refers to the theoretical existence of alternate universes, not second Earths identical to ours in every way that just so happen to exist several hundred light years away. My criticism stands. I have really enjoyed reading your reviews Kethinov! I don’t always agree 100 % with your conclusions but I have, up to this point, really been impressed and enlighten by your insights and your observations. However, I must say with all honesty I am a bit surprised at your review of “Miri” Kethinov and your rating of zero! Zero? Really? ZERO? Seriously? My God, you gave a rating of 4 to “Spock’s Brain” for crying out loud! The thrust of your criticism seems to be why a “identical” Earth exists since, in your words, this is impossible! I don’t get the criticism! I really don’t! Hardly anything in Star Trek is possible. It is pure fiction! Will there ever be transporters, phasers or time travel? Who knows! I just love wondering if they could happen. But that doesn’t mean they will happen or that I believe they will ever happen. So following your logic Kethinov: Removing a person’s brain and reattaching it is possible but an identical earth is impossible. OK my friend if you say so. To me the “identical” Earth was just a teaser to draw you into the story. And it worked for me. In fact, Star Trek became known for using the “teaser” to draw fans into a story. I like the fact that they didn’t explain how the identical “Earth” developed myself. And if you stop and think about it, anything they would have tried to explain about the other Earth’s existence and development would have been pure conjecture on their part. I love this episode! I think it was one of the top ten episodes of the first season. I still get goose bumps when I watch it. One of the biggest reasons why this story works for me is Kim Darby. I think she is a fantastic actress and she gave such realism to her role. Another was the acting of Michael J. Pollard, which was superb. I know one of the criticisms was the acting of the children but, quite honestly, I never expect great acting from children in shows. And I have to ask: when did great acting become a measuring stone for a great Star Trek story? I love William Shatner as Captain Kirk! But do I think he is a great actor in the role? No way! But he makes me believe he is James T. Kirk. And that is all that matters in film and TV. I give “Miri” an 8 rating. I think it is that good. I know it has some plot holes and I know it leaves some unanswered questions, but so do many other Star Trek stories. I just don’t think some of the comments on here are very objective and seem to be concentrating on some very petty issues. (1) We get to see more of Lt. Farrow ( played by Jim Goodwin ) To me Farrow was a very down to Earth ( opps sorry no pun intended ) character. He wasn’t handsome or big or strong. He just seemed like a real person to me. I wish more of the secondary characters could have been like him. (2) No “Red Shirts” were harmed during the filming of this episode! Probably the first and last time that ever happened! LOL. In fact, I don’t think Lt. Galloway ( David L. Ross ) nor the second security guard ( John Arndt ) even contracted the virus at all! Wow I guess it paid to be a “Red Shirt” this time around! LOL. 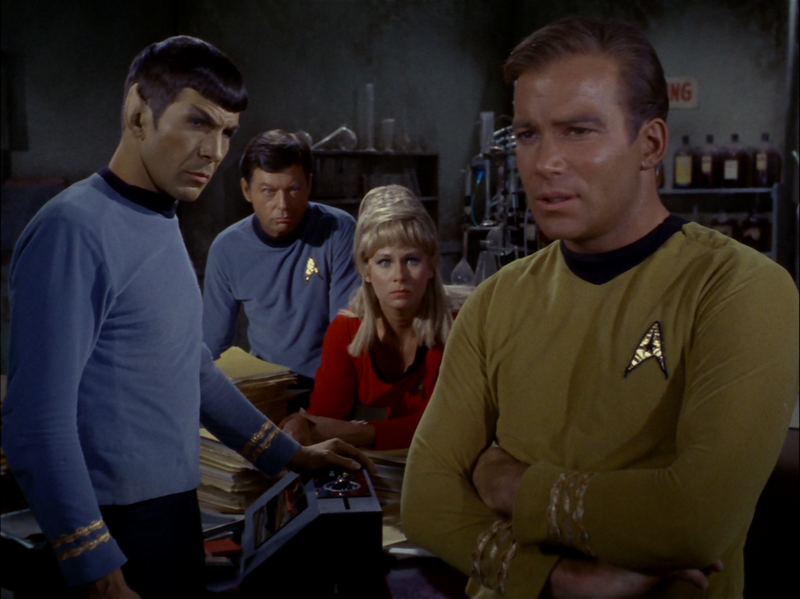 And finally, (3) I loved how they began the development of the relationship between McCoy and Spock in this episode. When Dr. McCoy injects himself and almost sacrifices his life, I think Spock really starts to admire the doctor and the person that he is. I still get a little chocked up when I hear Spock say, “I will never understand the medical mind.” And of course Spock says it so low that I don’t think anyone else can hear it. A great moment in Star Trek history. Surgically removing a brain without killing it is considerably more plausible than the hypothetical existence of another Earth identical to ours in every way. The brain is just an organ like any other. As long as the proper fluids are not interrupted and no substantial injuries are inflicted during surgery, there is no reason why the brain couldn't survive independent of the body. 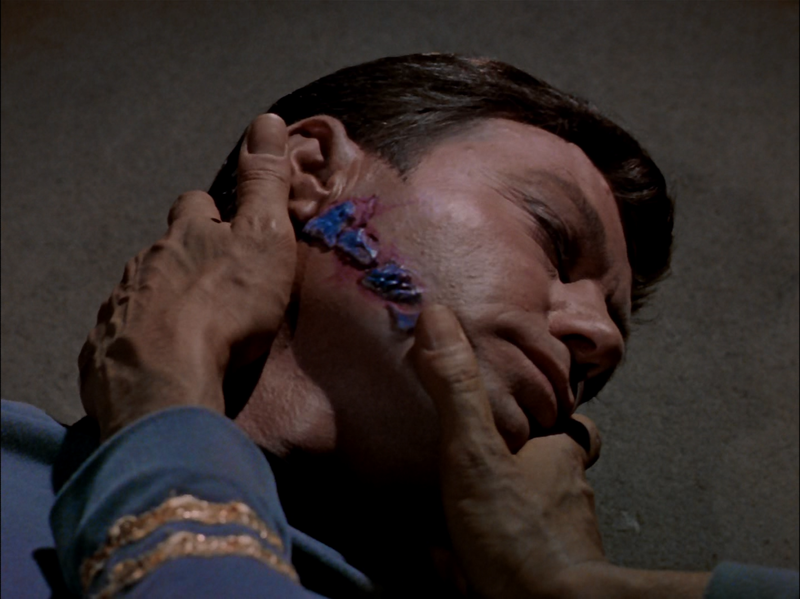 In this respect, Spock's Brain is considerably more plausible than Miri, especially given that the episode goes to great lengths to establish that the surgical techniques used are highly advanced. Your whole point about how "hardly anything in Star Trek is possible" because it's all just fiction is not valid. Good science fiction builds bridges between real science and the speculative science featured in sci fi stories. Phasers are particle weapons predicated on speculative technological advances in the efficiency of energy storage and release. Transporters work on the same principle but for a (usually) non-weaponized purpose. These devices are plausible assuming that it could some day be possible to harness and control energy so efficiently. The planet in Miri on the other hand violates everything we know about nature in space or otherwise. Everything we know about planet formation tells us that every planet in the galaxy is a unique combination of circumstantial randomness when a star system is born. If a planet like the one in Miri did exist, the scientific implications would be daunting. That would imply a considerably more deterministic universe than things like quantum mechanics teach us is possible. To put this in perspective, consider the old adage "no two snowflakes are ever alike." Strictly speaking, this isn't true. There are people who have tested this and determined that two snowflakes can be alike, but the probability is insanely small. If the odds against any two snowflakes being alike are infinitesimal, then what do you suppose the odds of two planets being exactly alike are? Earth is huge, and its history is the culmination of billions of years of random events. There's simply no way we'll find another Earth out there. Similar planets, sure. But not the planet found in Miri. It simply cannot happen. As such, the premise of Miri is pure fantasy, rather than the kind of responsible science fiction things like phasers or the transporter are based on. As a critic, it's my job to make this distinction for my readers. I want my readers to know which episodes are good science fiction and which episodes are not. This one is not. In his first volume of Star Trek episode adaptations, James Blish supplies a backstory that is vastly different to that of the "identical Earth" premise depicted in the television episode( "Miri" ). Blish wrote that Miri's planet is the fourth planet orbiting the star 70 Ophiuchus, and is a beautiful Earth-like planet having one large and two smaller continents connected by islands. Ophiuchus IV (or Ophiuchus 4 – Blish never names the planet) is located between twelve and fifteen light years from Earth and had been the first planet outside Earth's solar system to be colonized, in this case by refugees from the so-called "Cold Peace" in the early 2100s, about 500 years before the events depicted in the television episode. These colonists were isolationists who violently repulsed the first attempt to contact them by a later expedition from Earth, and so no further contact was attempted. As it turned out, the Ophiuchus system was in a "backwater" part of the galaxy that subsequent years of Earth-based space exploration passed by, and so the belligerent colony was easily ignored and almost forgotten. Around 300 years before the events shown in "Miri", scientists on Ophiuchus IV developed the experimental life-prolongation project that resulted in the deaths of every adult on the planet. Yet despite their close proximity, the distress signal sent by the colony didn't reach Earth because Ophiuchus IV stood between Earth and the center of the Milky Way, whose radiation created interstellar static that drowned out the SOS signal the colony had directed towards Earth. Speaking of units, scientists frequently use non-metric units: light-year, parsec, astronomical unit (equal to the radius of the earth's orbit), (an) atmosphere (a unit of pressure, though more for convenience when precision is not paramount), G forces, electron volt, barn (a barn is 10^(-24) cm^2), fermi (which is 10^(-13) cm). These last two are based on a metric unit, but so is the inch (defined as 2.54 cm), so it's just as "bad", sort of). The electrical charge of particles, in many cases, is more conveniently measured in multiples of that of a proton, as in the charge on an electron (which would be -1), or quarks, which, depending on which quark you're dealing with, is +/- 1/3 or +/- 2/3 of that amount of charge. There's also a foot (of cable, or patch cord, if you will), which is how far light travels in one nanosecond. This is useful in high-energy physics experiments for estimating delays. I believe calories are still used by some, though I'm not really sure. Add to all this units of time: years, months, weeks, and days are not metric units, yet scientists use days and years, at least. The dinosaurs were wiped out 65,000,000 years ago. No one converts that to seconds. Angstroms are still used (based on a metric unit, though). There are probably more. Bottom line: Use the units that are appropriate for the job. Super late to the discussion, but you guys are arguing the wrong point. The issue is not whether an earth-duplicate is possible, as stranger things have happened in the Star Trek Universe. My biggest gripe is that they didn't even investigate it! Kirk says, "It seems impossible, but there it is," and no more is said on the subject. 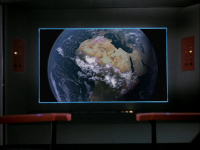 If Picard had stumbled on a planet with The North American Continent staring back at him, he would have gotten to the bottom of it. That's what defies my suspension of disbelief, that no one seemed to care about that which in any normal universe (even one with humanoid-looking aliens) could not happen. I can forgive it though. These first few episodes are rife with far-fetched concepts that are treated rather nonchalantly: The invention of time travel, shape-shifting aliens, perfect copy androids, and now Earth 2. The obvious retconning would be to attribute the duplicate Earth to the same Preservers that transplanted the Roman Empire people and Native American people to other planets. 1960 is near the beginning of the Post-atomic age, the Cold War era, and the hybrid age. Presumable the Preservers theorized a scientific subculture in existence around 1960 was about to become extinct (or about to devastate Earth, in which case there should be a whole lot of 1960ish cultures out there somewhere in the Trek universe). In fact this group did prove to be devastating to the planet they were transplanted to. Likewise, the transplanted Roman Empire was presumable defeated by one of the same factors that the Preservers had apparently hoped to rescue them from. I can’t believe the tricycle scene at the start isn’t listed as a remarkable scene. When I watched that as a kid, that had as much punch as anything else in the entire series. This episode is naturally around 6 to an 8. I give it a 9 for some counterbalance. The children represent the intellectually limited horizon of the human race, the disease they are attempting to cure is the result of our own hubris in the manipulation of nature, and the episode is saying to us that our futile attempts to command the complexities of nature are childlike and prone to disaster. I for one have no problem that the Earths are the same, and it was not explained why. All we need to suspect is that it is the Earth, but a less lucky version of it. Who put it there and why they did it, we won’t know. Nowadays every action hero seems to make amazing intellectual leaps of logic to arrive at the correct conclusion in mere seconds, and then blurts out their byzantine (but correct) reasoning at machine gun pace, with only the occasional disinterested flip of their hair to signify to us just how bored all of this actually makes them. Whatever. The fact the identical Earth is not explained was because they had no explanation to give. They were clear on that, and it seems pretty straightforward to me. Onto the story. I’ll take that over idiotic “Q” or TNG techno-babble any day. I too, am very late to the great 'duplicate earth debate'. As far as I understand it physicists think that if our universe is infinite then not only would it be likely that there would be one duplicate of earth... But that it is almost a certainty that there would be an infinite number of duplicate earths along with an infinite amount of duplicate people. In fact, they have even calculated how far you would have to travel in order to reach another earth (it is, naturally a very, vey long way away). So, if the Star Trek universe is infinite, and warp drive let's you travel these extremely long distances then this episode is not as unbelievable as you would think! Great site by the way. Working through all Star Trek and love reading the reviews in conjunction! The timeline based on "Miri"
I too loathe this episode. For the longest time this was at the top of my list for the worst Star Trek episode. Though it has since been eclipsed by a few episodes from later Star Trek incarnations 'Miri' has withstood the test of time to simultaneously annoy me and cause boredom as few episodes of any show have. Miri has an intangible je ne sais quoi quality that sets it apart from all the rest. I think the biggest problem was that during early syndication there were but a very few television channels and given the choice between any Star Trek and something else, I still chose to torture myself with 'Miri' which had the result of grinding in my dislike for this episode. At least 'Spock's Brain' had the quality of being unintentionally funny. 'Miri' was just unintentionally bad. As for the duplicate earth debate, I understand your point. There is no way a duplicate earth could evolve on its own and many of the explanations offered on this page do not hold much water. And, I too have my pet peeves about certain aspects of Star Trek. Chief among them are discontinuity issues that need not be there and are due to lazy writing. That said, I understand why the duplicate earth was in the script; to make the point that this could happen to us. Plus, similar objections to the absurd implausibility of a duplicate earth could be said of most any Star Trek episode; let's start with the problems associated with faster than light travel. Absurd implausibility just isn't a road you want to go down when criticizing Star Trek but I guess it is still better than my 'je me sais quoi' objection. I agree that the whole issue could have been handled better although a way that doesn't its self create problems of its own escapes me for the moment. OK, here's how you can have two identical earths: Macroscopic quantum entanglement! OK, just fibbing. I always thought Michael J. Pollard looked a little old for the part. Just checked: He's 8 years older than Kim Darby! Hah! Wait a minute . . . .
From wikipedia: Kim Darby was born in 1947, making her 19 at the time! Michael J. Pollard was born in 1939, making him 27! Even worse than I thought. This type of thing happens from time to time in the entertainment industry. You have to admit that Kim Darby did a great acting job in this episode. Add to that the fact that she was a 19-year-old acting as a 13-year-old. KIRK: . . . We still don't know what we're fighting. Hmmm. It didn't seem like they ever had any of these symptoms anytime in the show. Wait a minute. Kirk says they don't know what they're fighting, but McCoy says they know what it is. Isn't that a contradiction? Our heroes were there for what, a week? I hope Scotty beamed down some clean clothes! More on units: In astronomy we have the Hubble constant. In what units is it typically expressed? (km/s)/megaparsec. OK. First, a parsec is not an SI or metric unit. Second, the constant has dimensions of inverse time (the two distance units canceling out dimension-wise). So in the SI system the Hubble constant would be given in inverse seconds. But knowing the constant in inverse seconds makes it hard to interpret. When given in (km/s)/megaparsec it's quite clear. Assume the constant is 71 km/s/megaparsec. A galaxy's speed is then 71 km/second if it's 1 megaparsec away, 142 km/s if it's 2 megaparsecs away, etc. In SI units it would be some number of inverse seconds, and not very useful in that form. So this is yet another case where pure SI units (or metric, if you prefer) are not the best choice. Astronomy is guilty of still more non-metric units! Check the astronomical unit, the average distance from the Earth to the Sun. And then take stellar magnitudes. Not metric at all, and not even linear! A difference of five magnitudes means a factor of 100 in brightness, or energy output. In other words, a 1st magnitude star is 100 times brighter than a 6th magnitude star. Yes, a higher number means a dimmer object. Venus has a magnitude of about -4; the Moon, -13; and the Sun, -27, IIRC. How about _light-year_ as a unit? That's not metric! How old is the universe? About 13.7 billion _years_. A year is not a metric unit. In some cases it might be useful to convert it to seconds. That would be 4x10^17_s. (Underscore used to prevent possibly bad line break.) Sounds better in years, no? i loved this episode. re-watching from the beginning, i would rank this and "what little girls are made of" as my two favorites so far. is there something wrong with me? :P though mudd's women was by far my least favorite so we're on the same page there. 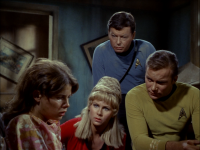 i found the situation to be intense and well-established, i liked the interaction between kirk and miri, and i liked the ending where kirk has to think like a child in order to get through to them, and mccoy takes a big risk to save the team. the fact that the duplicate earth thing isn't followed up on strikes me as a cool mystery to think about, tos is full of odd, cool things like this. i thought the main guest stars did a great job. thumbs up! "More on units: In astronomy we have the Hubble constant. In what units is it typically expressed? (km/s)/megaparsec. OK. First, a parsec is not an SI or metric unit. Second, the constant has dimensions of inverse time (the two distance units canceling out dimension-wise). So in the SI system the Hubble constant would be given in inverse seconds. But knowing the constant in inverse seconds makes it hard to interpret. When given in (km/s)/megaparsec it's quite clear. Assume the constant is 71 km/s/megaparsec. A galaxy's speed is then 71 km/second if it's 1 megaparsec away, 142 km/s if it's 2 megaparsecs away, etc. In SI units it would be some number of inverse seconds, and not very useful in that form. So this is yet another case where pure SI units (or metric, if you prefer) are not the best choice." OK, the Hubble constant is actually _also_ useful in SI units. Well, in inverse years instead of inverse seconds, anyway. When you work it out, H_0 = 71 (km/sec)/megaparsec = 7.26x10^-11 inverse years. Take the reciprocal of that and you get 13.8x10^9 years, the age of the universe! So it's useful both ways, contrary to my previous statement. I agree it is a difficult episode. The first one to have a visit to 'Earth' though? It is easy to judge these early episodes on the basis of much later material, but if we accept that the only explanation is either a parallel universe or even a time travelling Earth (why not? ), then everything is more plausible. It isn't a patch on 'what little girls are made of' though.